The Lion Mutters: South African students protest for #FeesMustFall: Do I care? 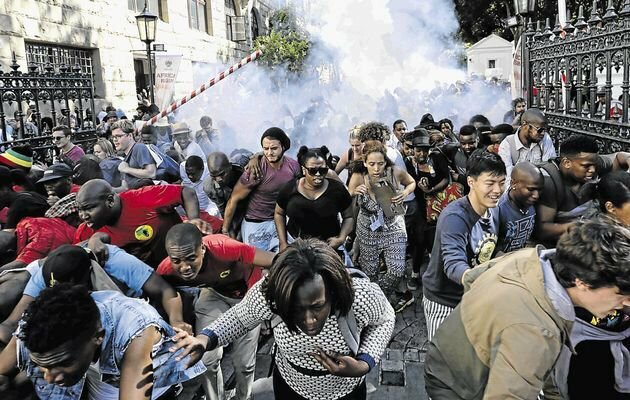 South African students protest for #FeesMustFall: Do I care? As bad as that sounds, I didn’t care because I just thought it was another step in the revitalised student protest movement which focused on something inconsequential. My awareness of the whole student protests started with #RhodesMustFall...obviously I was aware of what happened in 1976 following my 5 years of History in high school, but I did not care about the movement in its current form. 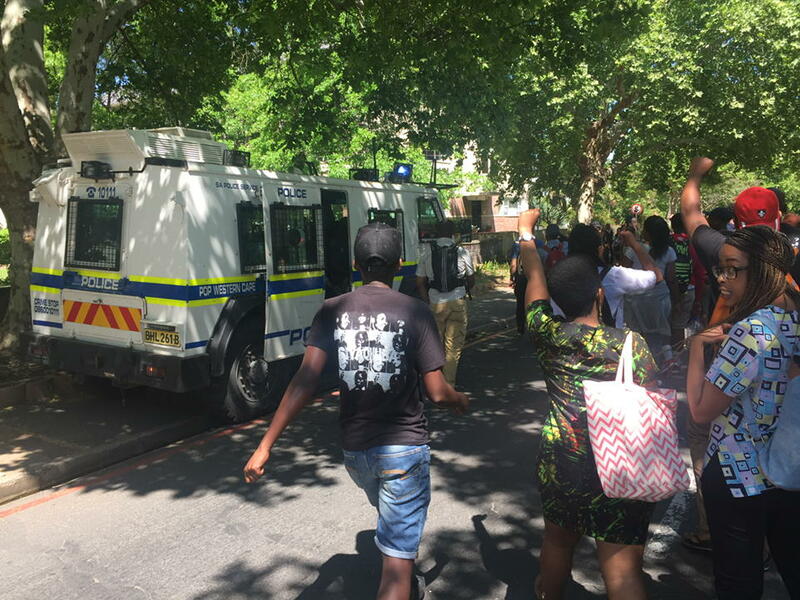 When it started, students were focusing on the Cecil John Rhodes statue, and what it stood for, and throughout my whole four years at UCT, I went by without as much as a clue that this was such a sore point. It was only following my graduation and subsequent employment did I come to learn that actually this is something monumental. Many saw the statue as a symbol of oppression and also the fact that the institution that they were studying act created an environment where being white was an advantage. Being someone of colour at the university made you feel like you were walking on sacred white ground. It made you feel like you should be grateful to the white people for allowing you to be on it, instead of feeling like you had the right to be there. This was the very feeling that I got from UCT during my time there, but I didn’t pay that feeling any attention because my main focus was that I going to the Number 1 University in Africa. How lucky was I? So when the whole movement started to decolonise the University, I understood the student’s point but I couldn’t care about it because the entire conversation became about statues and the whole true message was lost on me. I guess my upbringing as coconut (coloured/black on the outside, "white" on the inside) did its job. That being said, I don’t regret or have issues with my upbringing because it allowed me to do things that I may not have been able to. That aside, the whole student movement was just another issue. However, the events of the past two days (I was off on Monday), have forced me to sit up and take note. And for most of us there is pretty much where the train of thought stops. However, I was educated and enlightened on Wednesday following an interview that a Cape Times reporter and I did. They usually say that all it takes is for one person to raise their hand and affect change. Sascha Egelhof, a student from Stellenbosch University, is that one person for me. She might not realise it, but she had caused a change within me. The reason why Sascha’s story connected with me is because it made me remember something about myself. I had lived a bit of her story. "...I know that there are other students like me, that don't have the ability to voice their problems. that are almost ashamed of the fact that they are unable to afford their tuition. Other people who can afford these things, and don't worry about any financial problems are like "oh let's go go, and have a glass of wine." I am like 'oh I can't because I don't have any food in my fridge..."
It made me think back to my days of being the poor friend and how my friends would pay for me because I couldn’t afford it. My single parent mother of three boys had to provide rent money, food, electricity, travelling expenses (for her and for me) and also my tuition fees for UCT. For the income of a Personal Assistant to stretch as far as it did was a miracle. I was on financial aid for my entire degree. I didn’t realise how much of a big thing it was because my mother doesn’t like talking about finances and also she wanted me to focus on getting an education. I was ready to get a job but my mother didn’t want that to let it distract from my education. To this day, my mother us still paying off that loan...and the lack of fees was why I couldn't do my Honours degree actually. I was able to make it through university and get my degree because my mother was committed to my education, and also because of financial help...but it did not come without financial hardships. And yet, my story is one of the success stories. I am privileged. There are many stories from those who have faced similar or greater difficulties than mine. There are hundreds of more stories from those who have been accepted into university but had to drop out because they couldn’t afford the university fees. When my mother and I was talking about the fact that students across the country and are protesting for the right to education, she started crying because the students who WANT to educate themselves and create better lives for themselves, are unable to because they simply can’t afford it. All that these kids want it to be able to attend an institution of higher learning and to build lives that their parents (and themselves) have been dreaming of for years. But they can’t. Because tuition fees are already leaving the students with crippling debt by the time that they graduate, and now a proposed 11.5% increase in their fees would guarantee that they will never be able to have the education they deserve. When you are living from hand to mouth like a few of these kids in the Fees Must Fall campaign, fees for tuition can easily become seen as a luxury, and not a need. 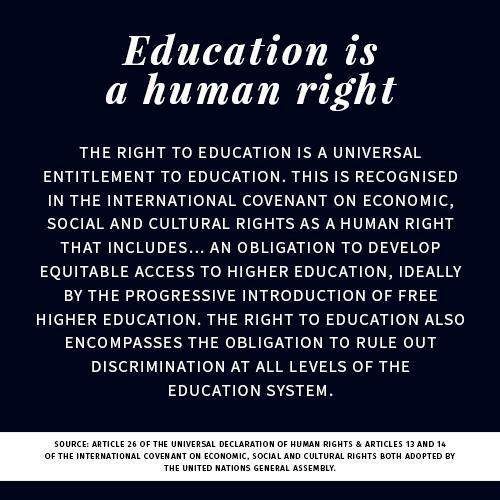 Education shouldn’t be a privilege, it should be a right. But with this proposed raised, the message from those in higher education is that clearly education should be a right of those who can afford it and not those from the middle and lower classes who want to learn and succeed in life, but don't have the large sums of money to afford it. The Fees Must Fall movement is the voices of those who come from poor or middle class backgrounds taking a stand saying that education should not be available to only those who can afford it but that it should be available to all regardless of race and class. We live in country where without a degree from a university or tertiary institution then your options of being able to create a better live for yourself and the future generations is near impossible. It is a common held belief that if you want to become a success then you need to have a university degree, but how are you supposed to do that when you can’t afford to pay for your education? The reason why people fought in 1976 was so that their kids could have an education that would allow them to better themselves but yet here we are with a generation of kids who are still fighting for the same battle to get an education. I care about #FeesMustFall because if I was still at university, I would have been forced to drop out. There is no way my mother would have been able to pay that. I would not have been working in the environment that I am today, and not have had the experiences which have forever shaped my life. I do have one issue with the movement which is that they want are disrupting other kids from continuing with their education. I understand their frustration because they want their voice to be heard but how many more people are they isolating from their movement because their actions?? It is difficult for me because I find myself split into two minds about this. I know that I would have been studying and preparing for exams because of how important my education was to my mother. Yet this is a necessary action. No one can deny that this is huge (possibly revolutionary) movement taking place. The question you have to ask yourself is where you find yourself standing in this movement?